Like most of our readers, the staff at BN Realty has a hard time believing that our children are headed back to school already! It comes in August of each year, but that doesn’t mean that we’re ready to trade the laid back summer vibes that our families have gotten accustomed to for the tight schedule that the school year typically brings. Perhaps one of the reasons that the school year sneaks up on us is that some of us tend to be unprepared. 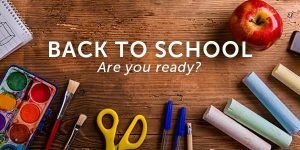 We want to share with our readers some tips to get the kiddos (and yourself) ready for the new school year! Set (and stick to) the school bedtime and wakeup times. This will make it so much easier to transition away from staying up late and sleeping in each morning. Be adamant about this and start setting those alarm clocks! Keep the entire family healthy with a balanced diet, regular exercise, and even stress reduction techniques. Remember that breakfast is the absolute most important meal of each and every day! Be mindful that the kids aren’t just grabbing a sugary treat on their way out the door. Make sure everyone is up and moving in time to sit down and eat. A breakfast high in protein will help keep everyone full longer and ensure that their bellies aren’t rumbling before lunch time. Sitting in a classroom all day can leave many children feeling antsy by the time they get home. Schedule time in the day to play and run off some energy to help with focus. Whether this is before or after homework, just make sure it happens. Children and parents may start to experience some stress about the new school year. Figuring out the best way to manage this will be key for the family as a whole. Maybe it’s taking a nice walk through your neighborhood after dinner or sitting down together with all technology off – opening up an atmosphere to talk about everyone’s day will ensure that there is support and understanding for your children. Start organizing your home and your life! Bins or baskets strategically placed around your house can help eliminate clutter and ensure that no one is losing important paperwork. We personally like giving each child a “mailbox” in the home for letters, report cards, important books, assignments, and class lists. So what do we mean by organize your life? We’re talking about keeping your schedules straight! A cute chalkboard or dry erase board will look great in your home and keep everyone on the same page. Writing on there who is picking up Bobby from soccer practice or who is taking Susie to music lessons will be very helpful on busy days. We know that life is about to change for your family with the start of the new school year and that it may seem a bit overwhelming right now. But we want to be the first to remind you how important it is to provide a loving household for your children to run to when they get off that bus each afternoon. One of the keys to this is, of course, the home itself. If you are interested in upgrading that home of yours in any way, please don’t hesitate to call us and let us help!